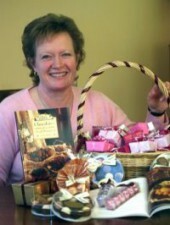 Julie Haylock-Sherry is the Chocolate Lady. Chocolate is probably the most popular luxury food. Almost everyone loves to be spoilt with the creamy smooth taste of milk chocolate or the bitter-sweet flavour of plain chocolate. The appeal of chocolate is wide, from the youngest to the oldest members of your family, male or female - age and gender are no barriers. 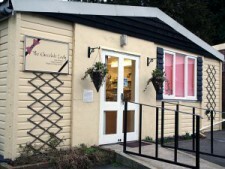 Visit our shop in rural East Anglia. 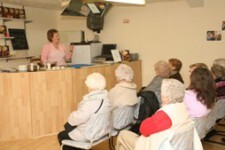 Or attend Julie's demonstrations and courses. Want to learn more about cholocate making, why not book to see one of Julie's demonstrations or attend one of her courses. Want to try something new for your hen party? The Chocolate Lady Runs a very special chocolate experience for this very occasion. 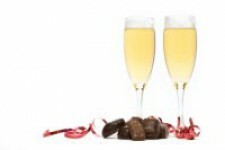 This includes hands on chocolate making, a chocolate fountain with strawberries as well as champagne. If you would like to find out more about having your hen party with us please do not hesitate to contact me. "Fascinating and mouth watering humorous presentation." "Enjoyable afternoon – lovely meeting you." "Inspiring talk by a very clever lady." "The best demo I’ve been to – fantastic!" "Very entertaining afternoon and delicious chocs."